So I’ve just moved into an art studio amongst the old industrial units in the centre of Sheffield. The space we’re in was once a silver plating factory. The building across the road manufactures ‘mild steel tube, steam trapping equipment and M.S. flanges’ (whatever they are). There is a hum and distant clanking and a gritty metallic smell in the air – this is where things are made, real things made of metal and grease that need skill and experience to fashion. On the edges of this space – and slowly encroaching as factories close and warehouses are emptied – I can see the shiny new world of student flats and apartments for young professionals with underground swimming pools and free wifi connections. But the roots of this city are still here and they run deep, deep into the earth, rooted in coal, iron ore and molten steel. I can remember the first time I laid eyes on Sheffield as a naïve 14 year old, away for a weekend with my church youth group. We stayed up in the Peak District and took a night hike out across the crags. As we crested a ridge in the clear night the city lay shimmering like liquid gold pooling in the valleys below the Pennines. It must have struck a chord with me as I wrote about it in English class the following week but I couldn’t have known then what a significant part of my life this city would become. Sheffield doesn’t have the cosmopolitan self confidence of Manchester sprawling forty or so miles to the west or even Leeds – our Yorkshire twin in size if not in style. But it has an earthy generosity of spirit grounded in something real that the dark canyons of the steel mills stand in silent testimony to. The city teems with stories – many remain hidden, some merge and coalesce as lives intertwine, some explode across the world. But our stories don’t occur in some abstract realm, the spaces we live in shape us just as we shape those spaces. As this happens I am interested in how individuals and communities give places meaning. I hope to explore this here in my role as a pioneer minister by hearing stories and making art on the streets of the city alone and with others – breaking open the space, seeing what is really there, seeing what is really real, seeing possibility and in all this seeing beauty. 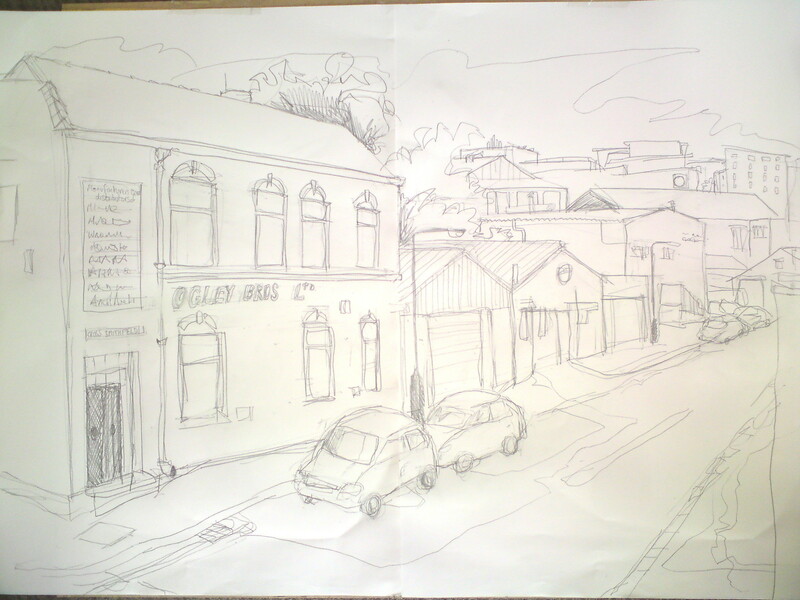 Now then, here’s a quick drawing of the view from the studio – It’s always good to start with what’s right in front of you (think I need a bit more practice drawing cars though).